Most Becker radios can be revised, by Becker, to accept input from an iPod. The model 1432 (Mercedes 1991-1993) and models 3302/3309/6003 (Mercedes 1999-2003) need a cassette inserted to activate the audio. Nothing plays through the tape. The aux audio is hardwired after the tape head. Most other models will not require the operation of the tape. 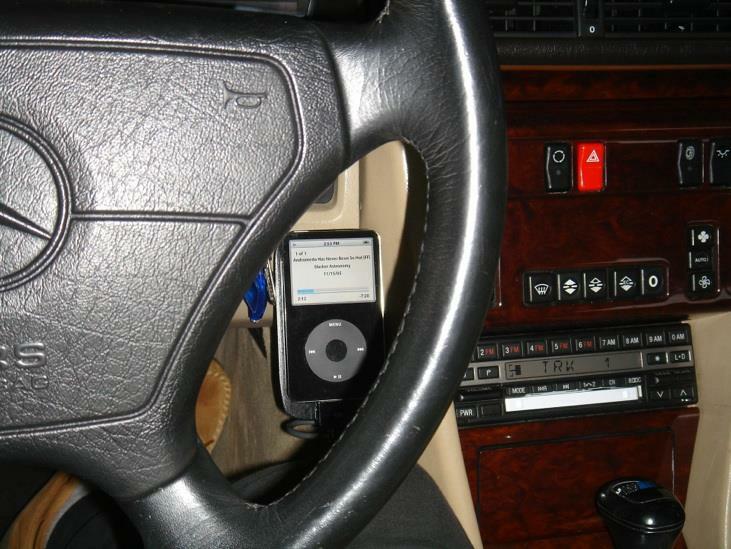 The following photos show the installation of my Video iPod in my 1992 300CE. The Becker 1432 head unit was removed from the car and sent to Becker of North America. For $100, they installed a special cable with module that is tied into the cassette mode of the head unit. They also supply a jumper, which provides the input from the iPod. In Photo 1 above, the special cable (gray) supplied by Becker is the upper left cable from the radio which terminates in the small square black module (labeled 'Input to Radio'). 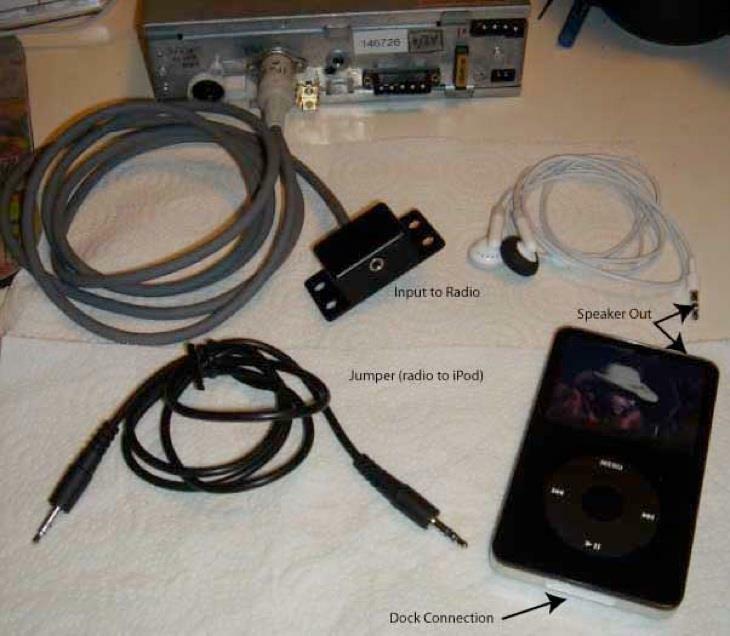 The jumper (radio to iPod) is the black, lower left cable with phono plugs at each end. This cable plugs into the module of the special cable on one end, and into the iPod on the other. The white-ish cable above the iPod, is the headphone buds that come with the iPod. Normal operation of the iPod, you use the headphone buds to listen to the iPod. In the car, of course, you wouldn�t. Method 1) Plug the black, lower-left jumper into the iPod Speaker Out port at top of iPod. The other end of the jumper goes to the module. 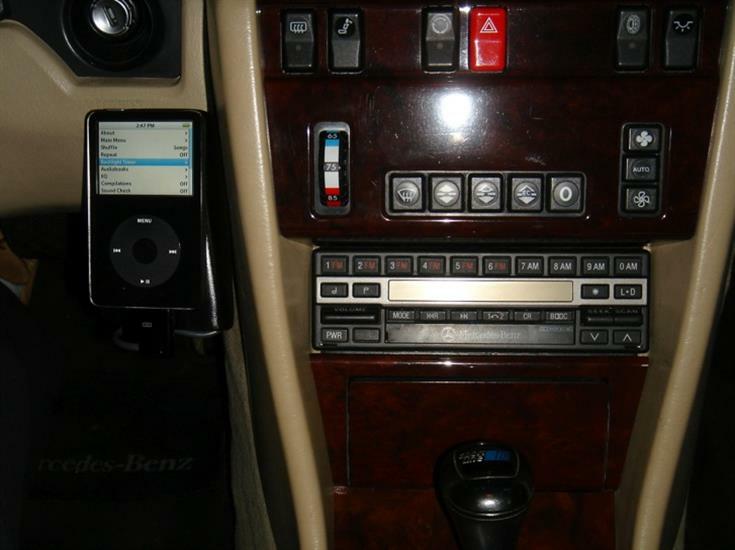 Put a cassette tape in the head unit, select the cassette mode, and as long as there is an iPod plugged into that black input module, the stereo system uses the iPod as the music source. The head unit controls the volume, treble and bass, balance, etc, just as if a cassette, the radio or a CD was playing. Unplug the iPod, and the cassette will play as normal. The only problem with the above setup, is that the iPod is not being charged while it is playing. Read on to Method 2 to learn how to correct this. Method 2) Plug the jumper into the Line-out from iPod port on the Belkin (Photo 2). Then the iPod Dock Connector (Photo 2) plugs into the iPod Dock Connection (Photo 1). This allows the iPod to also be charged while playing, whereas Method 1 does not. Above is an Belkin Auto Kit for iPod w/ Dock Connector Part # F8V7058-APL (white) or Part # F8V7058-APL-BLK (black) (cover removed showing internals). This unit provides a plugin for the cigar lighter for power, a line-out to optionally plug the iPod ear plugs into (rather than the iPod itself) and a standard dock connector. 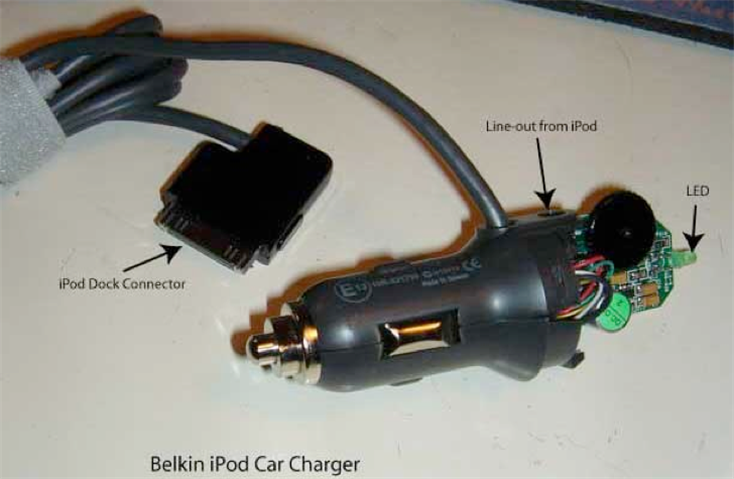 By hard wiring the Belkin unit into the radio harness, and putting the Becker jumper from the input module to the Belkin, the dock connector from the Belkin is the only connection that has to be made to the iPod. A wire is spliced into the black wire (pin #2) of the x1 radio connector that goes into the back of the Becker HU. The other end of this wire is then soldered to the center pin of the Belkin cigar lighter plug. This provides power whenever the ignition key is in the Accessory, Run or Start positions. A negative lead is soldered to one of the two side grounding prongs of the Belkin cigar plug and routed to and spliced into the brown ground wire (pin #1) of the same x1 connector. The x1 connector is the four-pin connector that plugs into the upper corner of the back of the Becker. Then connect the black jumper between the Belkin plug and the Becker module. Turn the little volume wheel on the Belkin plug to Full. All of these items (the Belkin plug, the Becker module and all of the connecting cables and wires) are stowed behind the radio. It is a very tight fit in my car, but they will fit. Only the dock connection of the Belkin extends outside of the console. 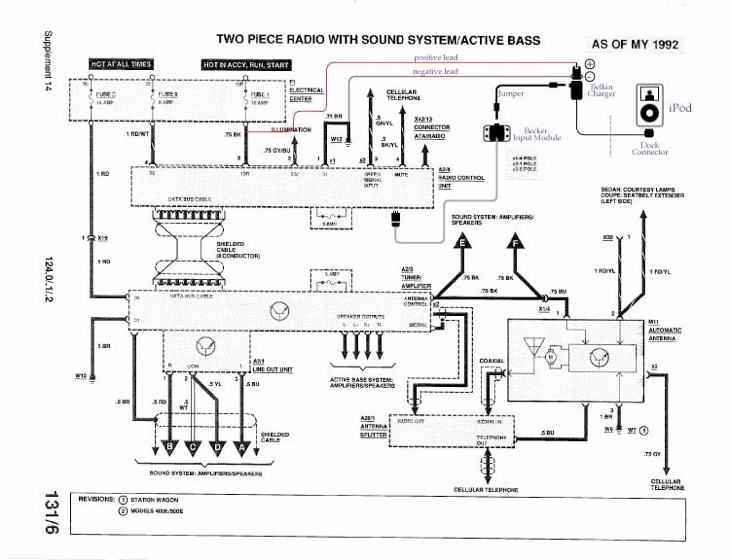 A PDF of the schematic is available here. Route the dock connector from the Belkin to wherever you are going to mount the iPod. Mount and plug your iPod into the dock connector, and now your iPod will be charging while it is playing. I fabricated a simple L-shaped bracket from .060" 6061-T4 aluminum sheet and mounted it to the side of the console, just below the ignition switch. The bolster underneath the steering column was temporarily removed to facilitate fastening the bracket to the side of the center console using four sheet metal screws. In Photo 3 above, I have attached the iPod using Velcro� strips on the back of the iPod and the front of the bracket (the bracket is behind the iPod and barely visible in this picture). Other after-market brackets are also available on the internet. The cassette tape must be inserted for this system to work (for this model Becker). Becker has hard wired the module into the cassette mode (the only mode actually contained in the head-unit - tuner, reciever, amp and CD stuff is in the trunk unit of the Becker). So the Becker must be in tape mode, ie, a cassette must be in and playing, and if the iPod is plugged in, the iPod signal is what gets played. But the cassette must be playing. If you want to retain the normal function of the cassette tape mode, ie, play a tape, you must have access to the module and simply unplug the black jumper from it. By unplugging the iPod from the square black module , complete cassette tape function is restored. As it stands now in my installation, with the black jumper wire always plugged into the module (because it is buried inside of the console), normal cassette tape function is inhibited, as the radio expects the source to be whatever is plugged into the module, ie, iPod or sat radio, etc. Photo 4 shows the view of the iPod from the driver s perspective. It is easily seen through the spoke of the Sportline steering wheel and within easy reach for changing or searching for the right song. So, at your fingertips, you could have 15,000 songs to choose from!